Cambodia’s tradition of silk dates back to Angkor times. Today, the revival of the weaving and sericulture of Khmer “golden” silk produces a unique modern style that merges the best of hand made traditions with the newest designs to produce luxury silks. Cambodian woven and sewn silk products are exported to many countries worldwide, especially to customers in France, Germany, Switzerland and other EU countries, United States, Australia, Thailand, Singapore and others. The best of modern designed Khmer silk will be on exhibition and sale in Lyon France November - December 2006. Cambodian Silk Forum is a membership only organization that links over 20 of the best producers of Cambodian silk products. Hand woven and luxurious, Khmer silk is always a special gift from Cambodia. How to chose the best handmade quality, colors, designs and information on the history and culture of Cambodian silk. Weaving is an ancient Khmer art and skill passed down from mothers to daughters and ons. Master weavers are still producing methods that date back to Angkor. Khmer Golden Silk is called “golden” because of it’s natural yellow color as it is unravelled from the native Cambodian silk cocoon. The formal name of the variety of the silk worm which produces yellow silk thread is a multivoltine cocoon. The most famous area for golden silk is Phnom Srok, on the hills above the Great Lake or Tonle Sap in NW Cambodia. 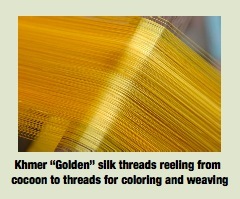 The golden silk thread is a single, roundish filament, with excellent light reflecting surface that produces the fine luster of the Khmer silk textiles. to 2.5 hectres family agriculture land, in addition to vegetable and fruit trees, and rice, thus providing a rural family with the means for income. generations. Due to the neglect of mulberry plantations during nearly 30 years of war and political strife, Cambodia’s golden silk yarn production decline from 1960’s of 150 tons/year to about 6 tons/year today. Thus, not only is this special quality silk highly beautiful but also rare. All the silk textiles woven in Cambodia prior to the war was woven from Khmer golden silk. Now, 100% Khmer golden silk textile can be purchased by special order. The quality of all silk textiles woven in Cambodia is still high due to the weaving and designs. Like most other silk textile weaving countries like India, Thailand, and Italy, Cambodia uses the best monovoltine silk threads as well, imported from China.